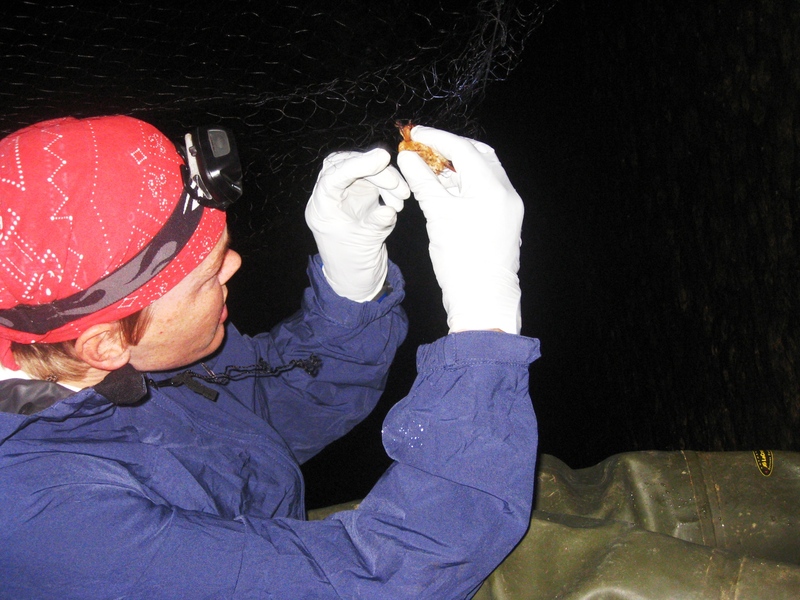 Double Springs, Alabama (March 27, 2014) — The U.S. Forest Service has discovered White-Nose Syndrome (WNS) in two bats collected recently in the Bankhead National Forest. The bats, which tested positive for WNS, were found in Armstrong and Backwards-Confusion Caves on the Bankhead National Forest. The specimens represent the first confirmed cases of WNS for Lawrence County, Alabama. White-Nose Syndrome is a disease characterized by fungal growth around the muzzle and wings of hibernating bats. First discovered in 2006, the disease spread rapidly from its origin in New York and is now as far south as Alabama and Georgia. WNS was confirmed in Alabama in 2012 with cases in Jackson County. The recent confirmed case in Lawrence County was the first discovery on national forests in Alabama. WNS has caused the death of almost six million bats that are an important part of forest ecosystems, helping to control forest and agricultural insect pests. According to Eric Schmeckpeper, acting district ranger of the Bankhead National Forest, the Forest Service issued a closure order for caves in all southern region national forests in May 2009 to proactively slow the spread of the fungus. The closure order remains active and includes caves in the Bankhead National Forest. “There is no known risk to humans from White-Nose Syndrome,” said Allison Cochran, a wildlife biologist for the Bankhead National Forest. “It is possible that people can spread the disease by inadvertently transporting fungal spores on clothing, footwear and gear that has been used in caves that have been infected,” added Cochran. Decontamination of clothing, footwear and gear can reduce accidental transmission of fungal spores. The Forest Service is working with the U.S. Fish and Wildlife Service, Alabama Department of Conservation, Alabama A&M University, Southeastern Cooperative Wildlife Disease Study and others to reduce the spread of WNS. In the event that a member of the public spots an infected bat, they should notify the Alabama Department of Conservation & Natural Resources at 256-353-2634 with information about the location. Bats that may be encountered on the ground should remain undisturbed. Visit www.whitenosesyndrome.org to learn more about this wildlife epidemic. Bats showing fungus on ears and wings, symptoms of White-Nose Syndrome, located in the Bankhead National Forest. The Alabama Bat Working Group will be conducting it’s Bat Blitz from 2:00 p.m. Monday, October 7, 2013 until the morning of Friday, October 11, 2013. The Nature Conservancy’s Headquarters (House) at 1481 Highway 72 in Gurley, Alabama will serve as the location to coordinate bat trapping and the place where the Fall meeting of the group will be held. The bat blitz is an organized effort to conduct many surveys for bats in a relatively short period of time in a particular area to determine what species are present and their relative abundance. Trapping will be held each night in the Jackson County and east Madison County areas. All are welcome and the event is free. This is an opportunity to learn how bats are studied in the wild just before the Halloween Season. You may attend any or all of the four nights. Meet at the Headquarters at 2:00 p.m. Monday or 10:00 a.m. any of the other days through Thursday. The Fall meeting will be held on Wednesday beginning at 10:00 a.m. Please complete the contact form below if you wish to attend (your information will remain private). We will provide a signup sheet and other information. A hoary bat captured during the Alabama Bat Working Group’s Mini-bat Blitz in 2010. The Alabama Bat Working Group will have its spring meeting at the Wheeler National Wildlife Refuge Visitors Center in the Decatur area on May 2, 2013 at 10:00 a.m. 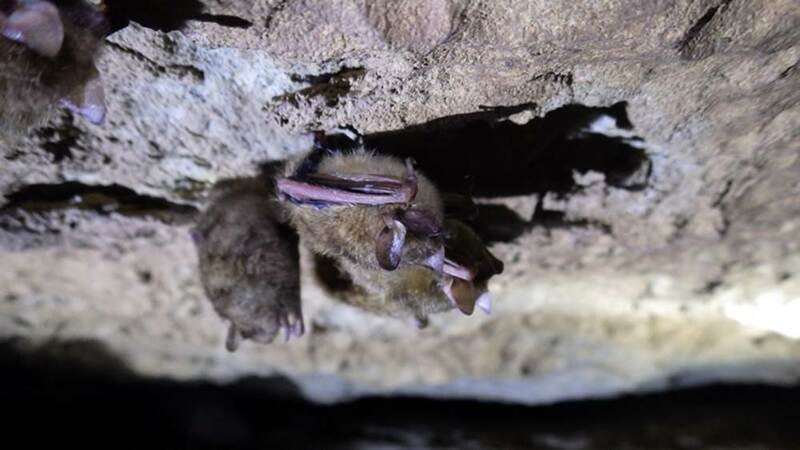 Topics will include the results of winter White-nose syndrome surveys, planned summer surveys and monitoring, and reports from subcommittees on ongoing work. If you have an interest in bat and/or bat habitat (caves/karst) conservation and management in Alabama you will not want to miss it! This includes those who would like to learn more about this valuable natural resource. We look forward to meeting you! WNS was first discovered in tricolored bats (Perimyotis subflavus) in Russell Cave in Jackson County, Alabama, in February 2012. In early 2013 the disease was confirmed in this same species in Fern Cave, also in Jackson County. In both cases, tricolored bats were confirmed to have WNS by the lab of the Southeastern Wildlife Disease Study located on the campus of the University of Georgia in Athens. Gray bats (Myotis grisescens) from Fern Cave appear to be carrying the fungus that causes WNS – Geomyces destructans (Gd). Five gray bats, including three live and two carcasses, were found to be Polymerase Chanin Reaction (PCR) positive, which indicates the presence of the genetic signature of Gd. However, four gray bat carcasses were collected in total and none had the skin invasion by the Gd which confirms the disease in bats. Thus, gray bats in Alabama are not known to be infected with the disease at this time. Photos taken of tricolored bats by cavers in two other caves in Jackson County in early 2013 have the visual signs of WNS. However, specimens would have to be collected and tested before it could be determined for sure if bats in these caves are carriers or infected. The current theory is that Gd begins skin invasion while bats are in torpor (similar to hibernation). Bats in torpor reduce the activity of many body functions including that of their immune system to conserve energy. This allows them to survive the winter on the fat deposits they put on eating available insects in summer and fall. The process of skin invasion by Gd irritates bats and they awaken more often during the period they are in torpor (often this is described as the hibernation period or season, but bats are not truly in hibernation because they normally awaken some during this season). Awakening from torpor requires the bats to expend energy. Over this wintering period the bats end up using all of their fat deposits prior to the end of winter. Bats begin to move toward cave entrances and have been observed numerous times further north flying around in the late winter. It is believed they are searching for insects because they have used up their fat reserves. Insects are not normally available at this time and the bats end up dying on the landscape, likely from starvation. WNS may take more than one year to begin causing mortality of bats. It is not known at this time if bats in southern areas, like Alabama, will begin dying in the numbers seen further north. However, they could begin flying outside of infected caves in late winter in future years, perhaps as early as 2014. If it happens, it will likely occur around Jackson County first since the disease is spreading there. Bats are not known to have the illness during the summer, although they may be carrying the spores (reproductive bodies produced by the fungus while it is growing on the bats in the winter) and show signs of wing damage. Sick bats during warmer periods of the year may be suffering from other illnesses, such as rabies. Sick bats observed outside caves during the winter may be impacted by WNS. 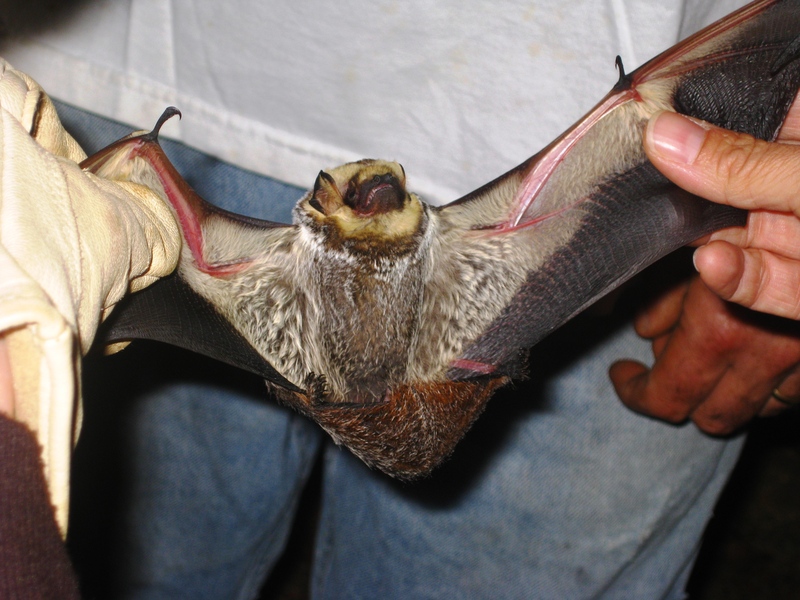 People who find sick bats should not handle them unless they have been vaccinated for rabies! If found during the winter or early spring, check the bats for signs of a white fuzz on exposed skin that you can see without handling them. Typical locations are around the nose, on the wings (including the forearms), and on the feet. Take photos if possible. Report the incident on this website. Be sure to provide information on the date, location, weather conditions, the size and color of the bat, whether the white fuzz was present, and other unusual conditions. Indicate whether you have photos available and your contact information. Having an e-mail address is handy should an Alabama Bat Working Group (ABWG) member need to contact you. Members of the ABWG do not have the resources to investigate all incidences of sick or dead bats that may be observed. This will be even more true as WNS spreads if it causes a similar amount of mortality as in states further north. However, reports by the public may prove very important in helping us track the spread of this disease in Alabama and may help us determine where limited resources should be utilized to check bats for WNS in their wintering caves. County or city health departments may be contacted if sick bats are found during the spring, summer, and fall to determine if they would like to test the bats for rabies. However, only someone with rabies vaccinations should handle the bats! Otherwise, you may be exposed to rabies. The ABWG is composed of individuals interested in bat conservation and management. Members come from several state and federal agencies (for example, the Alabama Department of Conservation and Natural Resources, U.S. Fish and Wildlife Service, U.S. Forest Service, U.S. Department of Agriculture – Wildlife Services, and National Park Service), private non-profit groups (e.g., several grottos of the National Speleological Society and the Southeastern Cave Conservancy, Inc.), and interested members of the public. Please join us if you are interested in helping conserve and manage Alabama’s important bat populations. We typically have two meetings each year. The next meeting is to be held at the Wheeler National Wildlife Refuge Visitors Center in Decatur on Thursday, May 2, 2013 at 10:00 a.m.